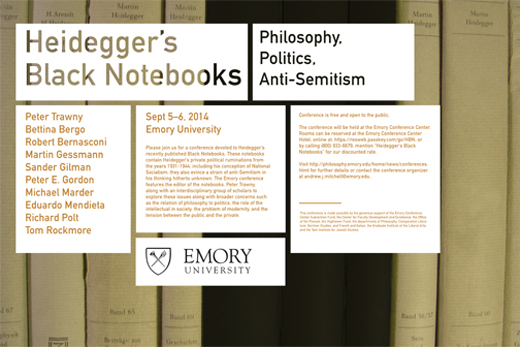 The recently published "Black Notebooks" of 20th century German philosopher Martin Heidegger will be the focus of a public conference at Emory University Sept. 5-6. An international roster of scholars, including the editor of the notebooks, Peter Trawny, will explore the issues raised by these newly discovered writings. Heidegger's "Black Notebooks" contain his private political ruminations from the years 1931 to 1944, including his conception of National Socialism (Nazism). The notebooks show a strain of anti-Semitism in his thinking previously unknown. The Emory conference will address these issues along with broader concerns such as the relation of philosophy to politics, the role of the intellectual in society, the problem of modernity and the tension between the public and the private. Trawny, keynote speaker for the conference, is the director of the Martin Heidegger Institute at University of Wuppertal, Germany, and a specialist in political philosophy. In addition to being editor for all of the "Black Notebooks," he is author of the first book about them, "Heidegger and the Myth of Jewish World Conspiracy" (2014, English translation forthcoming). His work on the notebooks has been the subject of articles, interviews and televised pieces across Europe. The conference, which is free and open to the public, will be held at the Emory Conference Center, 1615 Clifton Road. View the schedule and details, or contact the conference organizer, Andrew J. Mitchell, Emory associate professor of philosophy, at andrew.j.mitchell@emory.edu. The conference is made possible by support from the Emory Conference Center Subvention Fund, the Center for Faculty Development and Excellence, the Office of the Provost, the Hightower Fund, the departments of Philosophy, Comparative Literature, German Studies and French and Italian, the Graduate Institute of the Liberal Arts, and the Tam Institute for Jewish Studies.